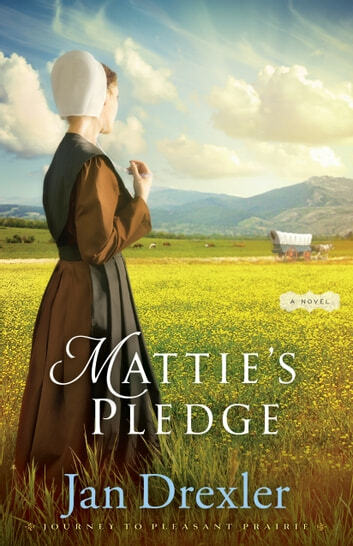 Tender, poignant, and gentle, Mattie's Pledge offers readers a glimpse into Amish life in the 1840s--and into the yearning heart of a character they'll not soon forget. Mattie’s Pledge by Jan Drexler is the second book in Journey to Pleasant Prairie series. Mattie Schrock lives with her family in Brothers Valley, Pennsylvania. It is April of 1843 and the family is getting ready to move again. Mattie’s father wishes to move further west and has decided upon Indiana (near a new Amish settlement). Mattie is excited about the move. She wants to keep going further west to see what it out there. She would really love to see the mountains. Mattie is also looking forward to seeing Jacob Yoder again. The Yoder family is joining them on the trip to Indiana. Andrew Bontrager (twenty-four) is relocating with his family to Indiana (the more the merrier on this type of trip, plus it is safer for all involved). Andrew is not ready to join the church or settle down. He flirts with all the girls. The families start out on their trip to their new home. Things go well until one night Jacob spots someone trying to steal a horse. They guy takes off, but they will need to be very vigilant. They soon notice three men following them. It is the Bates Brothers—Cole, Hiram, and Darrell. Cole is in charge and is determined to get the quality Amish horses (they will fetch more money). Cole has also taken a fancy to Mattie. Cole is planning on going further west which intrigues Mattie. Mattie will need to make a choice about her life. Will Mattie join the Amish church and settle down with Jacob or take off with Cole on a new adventure? What will Mattie decide? Will the families make it to Indiana unscathed? You will have to read Mattie’s Pledge to find out what happens! Mattie’s Pledge starts off slowly (the snails were passing me by). I liked the addition of the Bates Brothers. It added a little excitement to the story. In was interesting to read about the families’ attitude towards the thieves. Mattie’s Pledge is basically a romance story with a Christian theme. While it is the second book in the series, it can be read alone (the reader is updated on what happened in Hannah’s Choice, and we get to revisit the characters from it as well). The book has good descriptive writing, but it needed something more to make it more interesting/entertaining. I just did not find it engaging (it was predictable). I give Mattie’s Pledge 3.5 out of 5 stars. One thing that I found difficult was keeping all the characters straight. I have given you just an overview. There are more characters that are mentioned in the book (I just starting keeping track of only the main characters to make it easier). I received a complimentary copy of Mattie’s Pledge from NetGalley and the publisher in exchange for an honest review. The comments and opinions expressed are strictly my own.